Linda Callahan and her family have hosted Israeli scouts attending Camp Friedlander each of the last four summers. Her son, Aiden, is pictured here with the scouts who stayed with them this year, Ben and Jorge. Ben and Jorge knew they would fit right in. They had just arrived at the Callahans’ house after spending two weeks at Camp Friedlander, a Boy Scouts camp in Loveland. 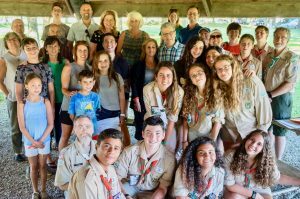 They were able to attend with six other Tzofim Israeli Scouts through a Partnership2Gether (P2G) program of the Jewish Federation of Cincinnati. They were getting to know the family that would host them for a few days before returning to Israel. Aiden, Linda Callahan’s 15-year-old son, had smiled and said yes. It turned out Aiden is an avid player of the popular web-based video game Fortnite, in which players work together to complete a mission. In this he is like many boys his age in the United States—and, as he quickly found out, Israel. 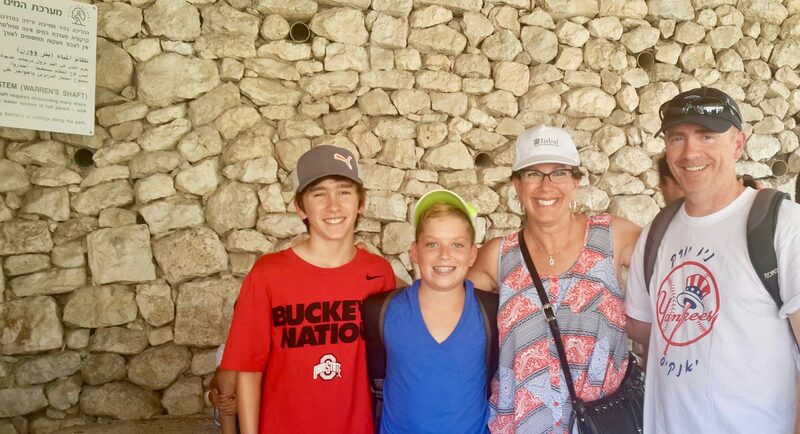 Linda and Dave Callahan have hosted Tzofim, including Ben’s older brother, each of the past four summers, something they started doing because they wanted their son to have a connection to kids in Israel. 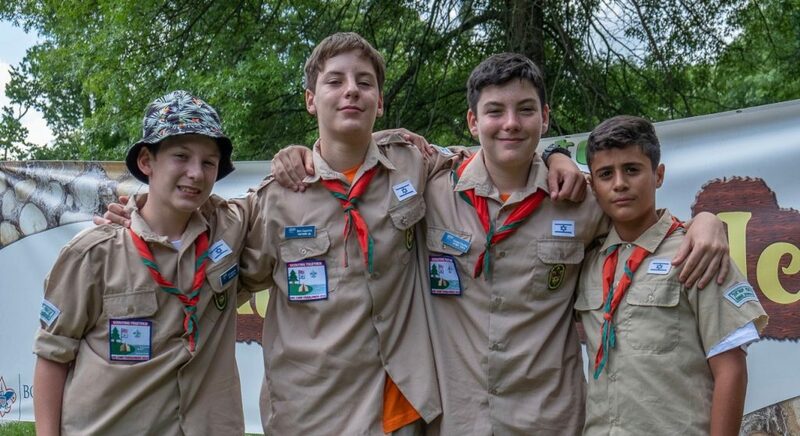 Eight Israeli Scouts and their leader spent two weeks at the Boy Scouts’ Camp Friedlander. They are pictured here with their host families from Congregation Beth Adam on the last night of camp. “We love the relationships that he forms and how that enhances his Jewish identity,” Linda said. Those relationships have been formed over the hours of playing ping-pong, air hockey, and video games in their basement. And it’s created lasting relationships. Aiden is already planning a reunion in Israel next summer. 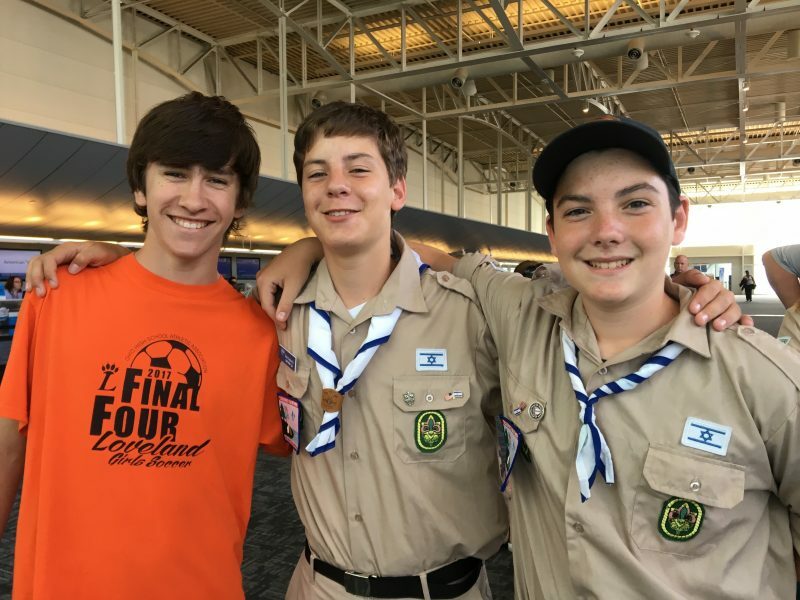 He’s going on a trip using his Israel travel grant from Cincy Journeys and wants to extend his stay for a few days to visit Ben and his twin brother Gil, who was also in this year’s Tzofim delegation, in Netanya. Linda has already been emailing their mom to arrange details. It’s not just her son who benefits from the experience. The first scout her family hosted, Omer in 2015, stole her heart. Even today, they keep in contact over Facebook, and she refers to him as her “Israeli son.” About a month later, Linda and her family visited Israel in celebration of Aiden’s bar mitzvah, a trip that was in the planning stages while Omer was in Cincinnati. During a family trip to Israel in 2015, the Callahans visited Omer, an Israeli Scout who had stayed at their house in Cincinnati that summer. When the time came, Omer and his family showed the Callahans around Jerusalem. On the same trip, the father of another scout named Guy who had stayed with them in the past picked up the Callahans in Tel Aviv and drove them to Netanaya, Cincinnati’s partnership city. Guy’s family hosted a lavish dinner and showed the Callahans around the city. They even made a special cake to honor Aiden’s bar mitzvah. “Because of the personal connections with these families, our trip was much more meaningful,” said Linda. Interactions like these are why the Jewish Federation and its P2G program bring the Tzofim to Camp Friedlander each summer, funded by the Federation’s Annual Campaign. P2G builds bridges between Cincinnati and Netanya through people-to-people connections. “One of the benefits of this particular delegation is that the eighth graders from Israel create personal connections, as well as strong and lasting bonds, with their host families from Congregation Beth Adam, who are Jewish, and with Boy Scouts at camp, most of whom are not,” said Alan Brown, P2G committee member and project champion. Ben and Jorge (center) spent two weeks at the Boy Scouts’ Camp Friedlander this summer. The delegation was funded by the Jewish Federation of Cincinnati’s Partnership2Gether program.